The "Apparently it's my day to do the links" version of the quick-hits. The Red Sox survived a home plate umpire with a quick thumb and beat the Twins 3-1 to earn a split of 4 game mid-week series. The Sox will start a series with Toronto tonight at the Rogers Center/SkyDome. The Sea Dogs used a decent pitching performance from Junichi Tazawa to beat New Hampshire. 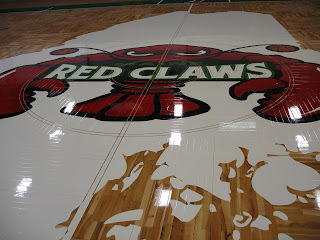 The Red Claws showed everyone the new parquet floor yesterday. One word-Stunning. Tom Brady injured his knee 263 days ago, and seems to be back to 100%(so far). Mark Rogers is on the road to recovery from injury. Maine high school scores are right here. Remember tomorrow morning will bring us another edition of the Big Jab Weekend Warm-Up, from 9-11a on 96.3 The Big Jab!